The minute this palette came out, I just knew I needed it! 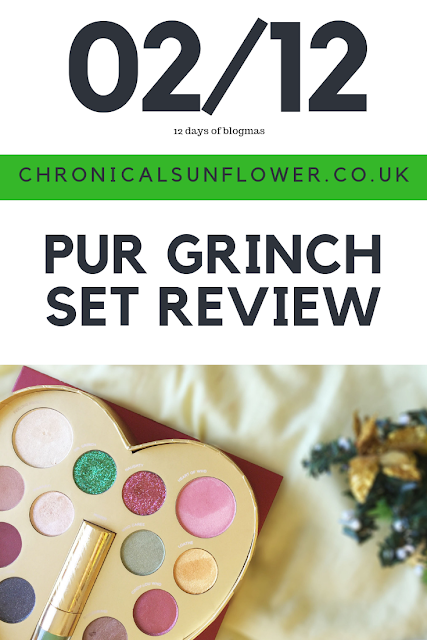 And what better way to start off Blogmas with a christmassy makeup review? The palette consists of 10 eyeshadows, 1 highlighter, 1 blush and a colour changing lip balm. I absolutely adore the packaging! The packaging has a little Who scenario as you open it, like a pop up book and then the eyeshadows pop out! The only downside to this is, no mirror, which I always like in a palette, but then again, when would I travel with this? The eyeshadows have great names which match their pigment 100%. The only downside I think are the two glitters at the top. Although they look absolutely beautiful, their quality doesn't feel that great to me, and it has a very "craft" glitter feel on my skin personally. However, they can look good on the skin with a good glitter primer! My favourite thing out of this palette is the lip balm. It's very creamy, moisturising and look it's green! Once it hits your lips it turns into a beautiful soft pink, which I tend to like in a lip balm. This palette all together costs £39 on Beautybay (however I got it for £36 and it is currently out of stock) and Look Fantastic and comes in a "Grinch" series, with brushes (not available on Beauty Bay) and face masks. Would I recommend it? Maybe as a gift for someone, or just an impulse buy. I honestly bought it because I love anything Christmas, but it's maybe a palette I'll play with every once in a while, rather than being a staple in my makeup bag for sure. It also looks great as a Christmas decoration, and adds a little sprinkle of joy to your shopping basket this Christmas!